SALT LAKE CITY — Society loves rooting for the underdogs. The inspirational message is motivating and relative to many current and former athletes. Hollywood’s depictions of underdogs in movies like "Rocky," "Hoosiers," "The Karate Kid" and "Dodgeball" only fuel the obsession. Monday night, however, was not one of those movies. Despite a jittery first quarter, Bountiful reaffirmed its consensus No. 1 state ranking with a dominating 76-44 win against an overmatched Provo team in the first round of the 4A boys basketball tournament at the Huntsman Center. Merrill was one of four Braves to reach the double-figure plateau with 20 points, along with Jeff Pollard (14), Zac Seljaas (10) and Jordan Bleak (10). Trevor Lloyd added nine points and three assists. Provo's Hunter Bailey and Grayson Magleby combined for 24 points in the loss. 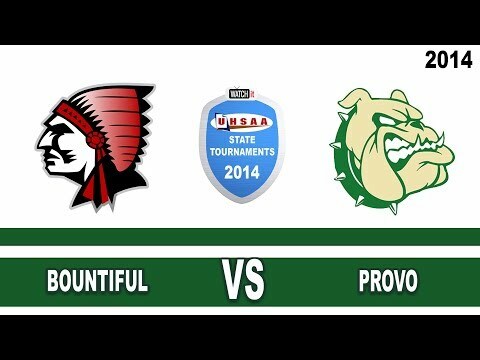 Bountiful topped Provo in points in the paint (42-14), points off turnovers (18-2), second-chance points (15-2), fast-break points (12-0), bench points (16-8), rebounds (36-20), assists (17-3), steals (8-5), blocks (6-0) and shooting percentage (56-33). Nonetheless, after the first eight minutes, Provo found itself only trailing 12-10. The Braves had missed several routine shots when Maxwell finally calmed the pace. The veteran coach called for Seljaas’ attention, motioning the play as he pounded his chest. Seljaas quickly penetrated opposite of Pollard’s screen and threaded a bounce pass to Merrill after the defense converged, which ultimately led to a three-point play. The patience settled the anxiety and ignited an 11-2 run (Merrill accounting for seven) before Provo’s Wesley Bosco rimmed a 3-pointer to delay the flooding. Late in the second quarter Merrill feathered another 3 for his 14th point of the half to give the Braves a 27-15 advantage before Bleak added consecutive layups to push the margin to 14. The Braves opened the third quarter on a 10-0 run, highlighted by six points from Pollard, to open a 41-18 cushion. Bountiful will face the winner of Mountain View and Logan on Wednesday at the Huntsman Center in the quarterfinals at 2:30 p.m.